There is this beguiling diagramme, showing the “high level” and “indicative” timeline: those with experience will know that the “detailed” and “committed” timeline never comes in quicker. Under this timeline “NPA Core Go Live” is completed towards the latter end of the period 2020-2025 i.e. in 2024 or 2025. But that is only the skeleton and then the flesh needs to be put on it in terms of getting current products and services to run on NPA instead of running on existing infrastructures. This beguilingly-named “Transition of Real-Time and Bulk”, which has the alternative sobriquet of “Transition of Back Book (Phases 3,4,5)”, supposedly runs partly in parallel with its own Build and Test phase. That cannot be the case. 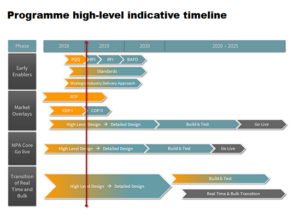 Pay.uk claim that the Build and Test phase will start around 2021 and go on until 2024, with the transition itself supposedly starting around 2022, 2 years before the transition target environment – NPA Core – has gone live itself. This makes no sense. Michael notes that “Many in leadership or positions of authority are talking a made up language no one really understands”. “Transition of the Back Book” is an example of made-up language where a person in authority “unnecessarily complicate[s] the process by using words that essentially make them sound cleverer than someone else”. What Matthew Hunt, the Pay.UK COO and leader of the NPA programme, is referring to is commonly known as the Migration phase. This is the migration of existing business off the current BACS and Faster Payments infrastructures and onto NPA, which cannot begin until NPA Core has gone live itself and been bedded in; that would mean migration would commence – not finish – in around 2025. If the duration of Migration is the same as is shown on the chart, it would be completed four years later – in 2029. Pay.uk’s chart misleadingly asserts that the migration will be complete by 2025, when this cannot possibly be the case. Following the launch of the NPA, a controlled migration of payments from legacy to the new real time and bulk architecture. The word “controlled” is a euphemism for “multi-year” and for “slow”. In essence Pay.uk are b/sing their regulators and other stakeholders (and possibly themselves) that there will be any positive contribution from NPA before 2030. That is 15 years after the Payment Strategy Forum Community Offsite at which the list of detriments was drawn up that NPA is meant to solve. Those claims were the genesis of NPA and we have to wait 14 years to find out if they are true, and indeed what mix, melange, blend, fusion, amalgamation, compound, synthesis or tangle of these and other technologies NPA consists of.